B2B education & consulting company dominates page 1 of Google! 8th & Walton is the leading provider of professional training courses and consulting services for Walmart and Sam’s Club suppliers (i.e. businesses that sell products in Walmart and Sam’s Club stores and on Walmart.com). Prior to working with me, 8th & Walton was already a leader in this niche – however, there was a lot of untapped potential from an SEO perspective, specifically: cleaning up technical issues on a large and dynamic website, good keyword research, proper on-page optimization, and research-based content creation. Before diving into the technical issues, I felt there were some low-hanging fruit opportunities to quickly improve rankings and traffic with good keyword research and basic on-page optimization for their main commercial site pages. 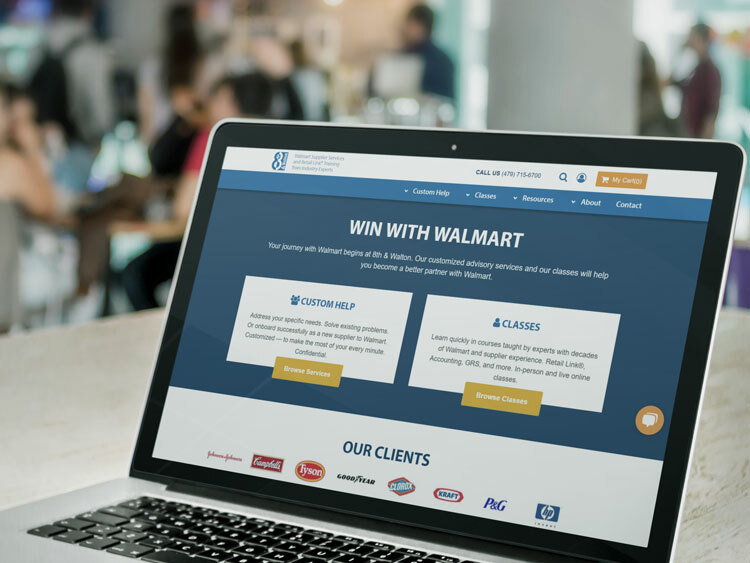 This was one of the “nichier” businesses I’d ever worked with – working exclusively with Walmart and Sam’s Club suppliers – so it was important to make sure we were targeting terms that were only/mostly being searched by their target market. Title Tags: because they were already an established authority in their niche, improving their Title Tags alone led to some quick and easy ranking and traffic gains. Page Headings: updated the main page headings (H1 tags) to more descriptive, keyword-rich verbiage. Internal Links: linked descriptive words and phrases from a few of their top authority pages to key service pages. Permalinks: a few of their main site pages were using less than optimal permalinks, such as multiple words combined together and URL parameters. Updating these URLs at the start of our campaign set us up for future success. Blog Template: although they had a highly active blog, I felt there were some basic features missing that were leaving some opportunity on the table. We added a prominent email newsletter sign-up, blog search field, and recent posts widget to improve both email opt-ins and engagement. An established brand with a dynamic website lends itself to a host of technical issues over time. A big technical audit was completed and improvements were implemented early on in our campaign – and we re-ran the audit on a quarterly basis. Broken Links: because of the dynamic nature of their course curriculum, there were a LOT (over 800!) broken internal links throughout the site, primarily from old blog posts linking to expired courses. We fixed a handful of broken external links (i.e. links to other websites) as well. Canonicals & Redirects: offering dozens of different courses (at multiple dates, times and locations) led to a lot of near-duplicate and out-of-date pages surfacing in search results. We used a combination of rel=canonical tags and redirect logic to prevent these pages from being indexed, and ensure that users would always land on the most relevant course page possible. Multiple URL Endings: all of the pages on the site were responding with and without a trailing slash – the concern being 1. Google may not know which one to index, and 2. it dilutes the value of their backlinks (i.e. some sites may link to them with a trailing slash and some without). Setting a sitewide 301 redirect from one to the other alleviated both of these issues. Paginated Pages: there were a lot of thin and/or duplicate pages appearing in Google’s index due to paginated pages (i.e. page 1, 2, 3, etc.) from the category, tag and author pages on their blog. We added rel=prev and rel=next tags to these pages to tell Google that they are part of a series. Large Image Files: a handful of unnecessarily large image files were slowing down their site. With page speed becoming a bigger and bigger ranking and UX factor, compressing large image files was an easy way to improve their average load time. As mentioned, 8th & Walton had a highly active blog prior to working with me; however, the amount of traffic it received for the amount of content they published was relatively low. This is often the case with businesses who churn out lots of short blog posts without using keyword research. The same level of keyword research I did for their main site pages was done for their blog around terms that were more informational/educational in nature. Over the course of our campaign, I consulted on a small handful of bigger content pieces that quickly became the highest traffic-driving pages on their site (and still are to this day). Over an 18 month period, total traffic increased by 193% and organic traffic increased by 251%. Of the 29 primary keywords we’re tracking, we are on page 1 for ALL of them, often times in multiple positions. It’s truly difficult to search any terms pertaining to Walmart suppliers without seeing 8th & Walton on page 1! Their email newsletter – the lifeblood of their education business – went from losing hundreds of subscribers every month to gaining hundreds of subscribers every month. The consulting side of their business has TAKEN OFF, in part due to the number of qualified leads their website generates from organic search month after month. Zack's work has been nothing short of amazing. We started working together as our email database was dying quickly, and through his efforts, we not only built stronger and more sustainable traffic from search, we also rebuilt a much healthier email list. I consistently hear from new leads 'I did a Google search for learning about being a better Walmart supplier and you guys were everywhere.' The credit goes to Zack—his expertise coupled with our content team produced really powerful results.